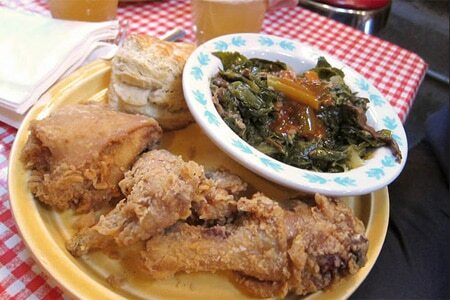 : Pies ‘n’ Thighs is a Williamsburg neighborhood institution for Southern cooking. Since 2006, hipsters and others have gravitated here to down craft beers and fill up on hearty fare. The restaurant offers more than its namesake, though, such as a decent hamburger that’s billed as the Insane Burger (perhaps because the grass-fed beef patty is topped with cheese, bacon and a fried egg) and cornmeal-encrusted catfish that tastes like something you’d encounter in the Deep South. But the real draw, of course, are the thighs --- or, actually, any part of the chicken. The birds are brined, a technique that holds in the flavor. Just one bite into the crunchy avian and you’ll be clucking with satisfaction. And that’s only half of the experience: save room for the pies, which come in banana cream, bourbon pecan and apple varieties; we like the s’mores pie made with a smoked graham cracker crust.